After sitting through UBC’s production of The Crucible, you feel as if you have been touched by the Devil. Through a combination of impressive acting, thoughtful set design and eerie sound effects, UBC Theatre creates an engaging and disturbing production of one of America’s most well known plays. Aidan Wright plays a convincing John Proctor, accurately depicting a man tortured by moral dilemmas and the necessity of self-examination. Other standouts include Shona Struthers, who embodies goodness as Proctor’s wife Elizabeth, and Jed Weiss, who pushes the audience to initially despise him and then wins back their sympathy as the Reverend Hale. Frank Zotter invigorates the third act as the sinister Deputy Governor Danforth, a man so sure of his convictions that he is willing to condemn people to death for them. The delivery of certain lines during his interrogations, and the repetition of the phrase “I see light in the sky,” is chilling. As the first student in UBC’s MFA acting program, his age and experience are evident, and bring depth to the production. One of the most impressive parts of the production is the set design. A large structure with exposed beams helps transport audiences back to 1692 Massachusetts. Little details, such as a worn quilt, a wooden rocking horse, and cast-iron lanterns filled with flickering candles help add to the provincial Puritan feel. The symbolism of these roof beams is revealed at the end of act three, when John Proctor cries “you are pulling Heaven down and raising up a whore!” This dual use of the set— as both a way to establish the setting and mood, as well as a way to symbolize some of the deeper themes of the play, is masterfully done. Director Jessica Anne Nelson stated that one of the biggest challenges of directing The Crucible is the sheer length of the production. “How do I keep an audience engaged for a four act play and keep them going on that journey with the actors and not getting bored and leaving at intermission?” she said. Although the play does not lag, there are times when the length becomes wearisome. Nelson succeeds in her goal of taking the audience on a journey, but because of the subject matter, the journey is an emotionally exhausting one. There is a lot of screaming, and while most parts are elegantly — albeit creepily — pulled off, there are moments where it is almost too much to bear and the audience just wants to find peace. Throughout this production, Nelson wants to challenge the assumption that John Proctor is the hero of the story and Abigail the antagonist, encouraging audiences to consider the gender and age related power imbalances that were present at the time. “[I want audiences to] receive the story that we’re presenting on stage to them, to invest in the struggle these characters are going through and not prejudge them, and to see that all the characters do have darkness and light within them,” she stated. Stepping out of the theatre after the production, it is hard to see any light. Shrieks of “I saw Goody Proctor with the Devil!” still seem to ring in the night, and the darkness of the horror that has just been witnessed eclipses any form of thoughtful reflection on power imbalances, present or historical. Perhaps UBC Theatre does such a good job of bringing the evil of the play to light that it overshadows the other elements the director is trying to convey. Despite this, reflection, both on what it means to be human, as well as what it means to tell the truth in an era of post-truth, are possible after the sun has driven away the witches and spirits. On the night of the show, however, surrender yourself to the palatable evil in the theatre and allow yourself to spend a few hours with the Devil. 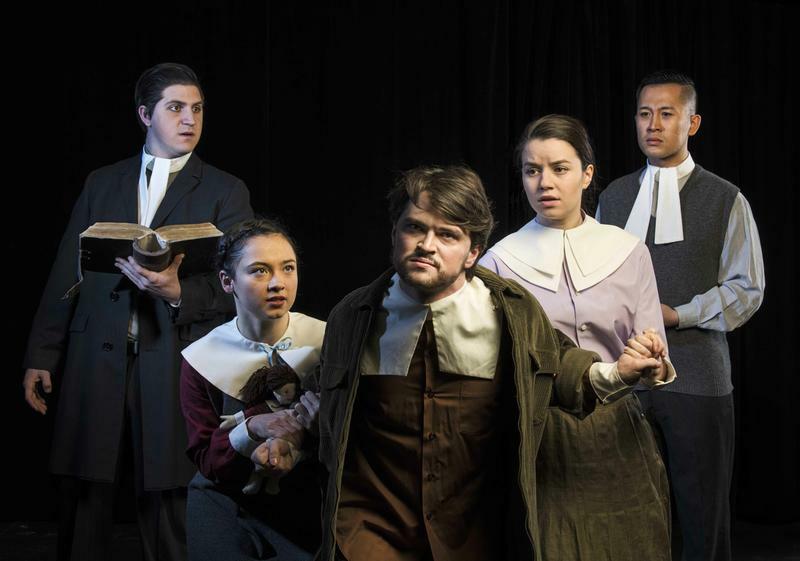 UBC Theatre’s production of The Crucible with be running until March 31. Tickets are available here.